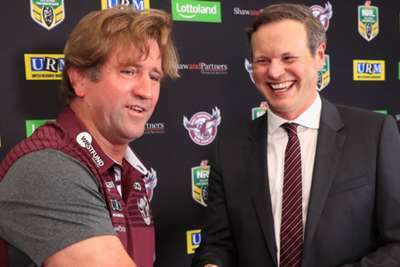 Des Hasler's return to Manly has been confirmed, appointed head coach of the Sea Eagles for the next three years. Hasler won two premierships as a player with Manly and another two as coach – in 2008 and 2011 – before leaving the club to take charge of the Canterbury Bulldogs for six years. The 57-year-old was sacked by the Bulldogs in 2017 and took a year away from the NRL. "Manly has always been a proud club, one that has had an extremely passionate and loyal supporter base," Hasler said in a statement on Monday. "We need to reinvigorate all of the ingredients that made Manly the club that it is, including maintaining the highest possible standards both on and off the field. "It is imperative that we engage at a high level with all of our members, fans and stakeholders to enable them to share the journey ahead with us. A journey that I know will be a great one." While Manly have appointed Hasler, Trent Barrett's future role at the club remains unclear. Barrett took charge of the Sea Eagles in 2016 and is reported to be contracted until mid-2019 despite resigning. "I think we've been clear for the last few months that Trent is still employed by the club," Sea Eagles chairman Scott Penn said. "He resigned. That was his decision and then as a club we need to protect our interests and that's exactly what we're doing. "We need a coach for 2019 and we're still working through that process."